Shirts With Random Triangles: Oregon Previews Uniforms For 2016 Alamo Bowl. 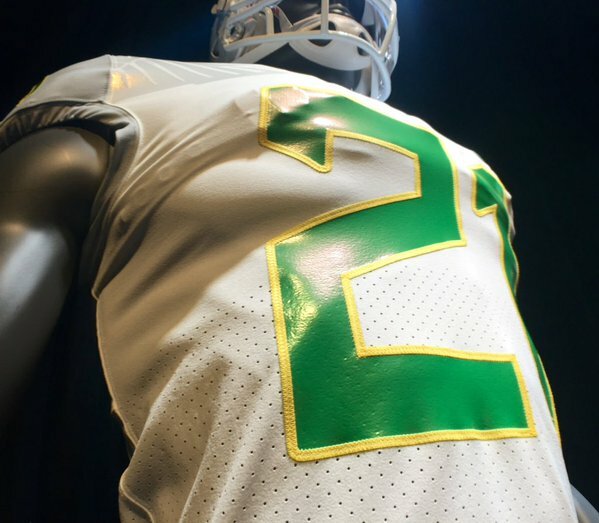 Oregon Previews Uniforms For 2016 Alamo Bowl. The Oregon football program has posted some images on its Twitter account teasing the uniforms the Ducks will be wearing in the 2016 Alamo Bowl. The new unis will be among the first of Nike's "Vapor Untouchable" uniforms, to be worn on the gridiron. The "Vapor Untouchable"unis are described by Nike as being "four ounces lighter than current Nike Football uniforms." This is done by having "fewer panels (five each in the jersey and pant) than traditional (uniform) builds." Oregon will face TCU in the 2016 Alamo Bowl on Jan. 2, 2016. The two schools have not played each other since 1978, when the Horned Frogs defeated the Ducks 14-10.